We enjoy a sweet dessert from time to time after supper. And when I’m having a chocolate craving nothing can beat homemade chocolate pudding. Pudding is one of the easiest desserts to whip up. And the thick, rich chocolate flavor and silky-smooth texture really satisfies the Choco-Monster in me. I’ll show my pudding-making procedure here and I’ll share the recipe below. First I lay out my ingredients. Look at the photo below – some pretty wholesome ingredients, huh? Only sugar, cocoa, low-fat milk, flour, butter and egg yolks along with boiling water and a splash of vanilla. There are no scary hard-to-pronounce ingredients here! Here’s how I put it all together: First I added the cocoa, sugar, flour & a dash of salt into my skillet and stir with my spatula until it’s all mixed. I added boiling water and butter and turn the heat on medium. As I stir, the butter melts slowly. When the butter is all melted I add the milk and stir. In my measuring cup I blend three egg yolks into 1/2 cup of tap water and pour it into the pudding, still stirring constantly. Soon the whole pan full of chocolate deliciousness will thicken to pudding consistency. When it’s as thick as I like it I’ll pull it from the stove and add about 2 teaspoons of vanilla and allow the pudding to cool slightly. We enjoy our pudding slightly warm so I ladle it into cute vintage jelly canning jars and chocolate decadence is only a spoon away! How easy is that? Homemade pudding in really no more time than it takes to open a box of the powdered commercial stuff, but with wholesome and real ingredients. Looks pretty good huh?? You can even mix the dry ingredients into a repurposed glass jar & make note of the wet ingredients needed. Then you have your own convenience food for those rushed nights. Yes, I’m willing to share the recipe. (I’m just good like that) Go ahead, give it a try! One of the quickest, easiest yet most delicious homemade desserts. Try this chocolate pudding recipe - I know you'll love it as much as we do! In a skillet mix dry ingredients together. Add boiling water and butter and mix well - place on stove burner set to medium heat. When butter is melted add milk and stir. Place egg yolks in measuring cup with the 1/2 cup cool water and mix thoroughly. Pour this mixture into the pudding and continue stirring and cooking over medium heat until thickened. 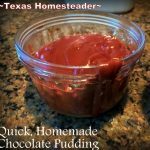 This entry was posted in Blog Posts and tagged Cooking, Frugality, Make-It-Yourself, Recipes on May 24, 2013 by Texas Homesteader. wow. so easy peasy. 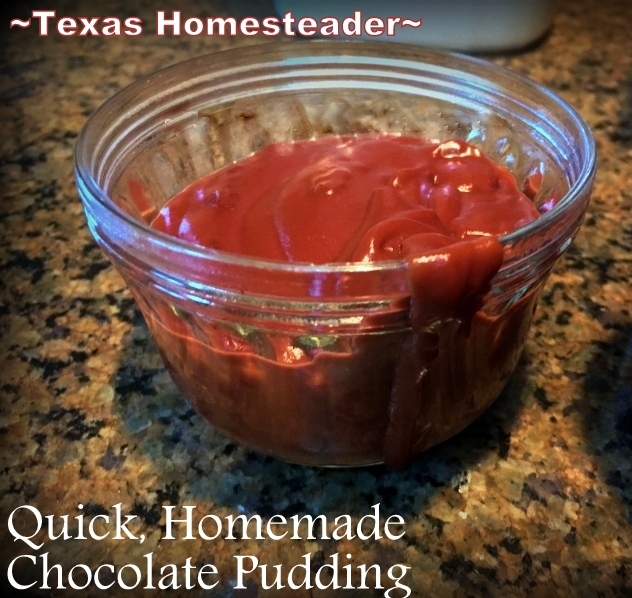 I knew you had a recipe for pudding that I wanted to try, so when my husband insisted that he have chocolate pudding, I searched your blog and found a match made in heaven. I am definitely trying this. I admit to using the Jello mixes and I am kinda shocked it is this easy. You always amaze me. Thanks for sharing on Merry Monday. Oh my yumminess! My eldest and I are sugar free at the moment but I will definitely be making this one day. I have 5 daughters in my house, all of which love chocolate like their mama! Well! I haven’t made homemade pudding in a few years. This does look good! I like the tip to add the egg yolks to the tap water… In the past, I did not do this and the egg would cook too quick. It’s an art! I’ll try it. Thanks for sharing this recipe – will give it a try this weekend! I bookmarked this page several years ago, and still LOVE this recipe!! My hubby is a pudding fanatic. He would eat it everyday if I made it for him that often. I think his middle name should had been dessert. Thanks for sharing this easy peasy recipe. Had hard, heavy rains in early hours this morning and just heard on the news that Johnson County received 5 inches. I will have to check our gauge once it gets light just to see how close we got to those 5 inches. There isn’t anything like homemade chocolate pudding. Growing up we always had some type of homemade pudding on hand. Your recipe sounds really good. Thank you for sharing on the Blog Hop Blitz! I’ve never tried this from scratch before, but it sounds amazing. Much better than instant. Thanks for sharing the recipe. I’m excited to try this! We don’t buy much in the way of prepackaged food at the store, so this will be perfect. We make most of our food from scratch, so why not try pudding too! And chocolate is my favorite! Your recipe is the featured post at this weeks Making a Home – Homemaking Linky at Linda’s Lunacy! your pudding looks so yummy! 🙂 http://lindaslunacy.com/2013/06/making-a-home-homemaking-linky-67/ Thanks for linking up! This looks delicious. And I had to smile because I have the same drinking glasses that you do! Looks absolutely delicious! Thanks for linking up to The Creative HomeAcre Hop. We hope to see you again this Sunday! Yum!! I love chocolate pudding. I attempted another chocolate pudding recipe a couple weeks ago (without eggs), and it was a complete disaster 🙁 I have been craving it though, so I will try your recipe! Thanks for sharing on Natural Living Monday! Such a great recipe for a delicious snack! Thanks for sharing it with me at Fidlin’ Fridays Link Party! Have a great weekend!